The proximal optimisation technique (POT) has been proposed as a strategy to improve the results of stent scaffolding of bifurcation lesions. It is a straightforward technique whereby a short, appropriately-sized balloon is inflated in the main vessel just proximal to the carina. The technique has several advantages: it reduces the risk of side branch compromise related to shifting of the carina, it improves stent apposition in the proximal main vessel, and it facilitates side branch access after main vessel stent implantation. When treating bifurcations, final kissing balloon dilation (KBD) has traditionally been used routinely to optimise angiographic results. However, recent clinical data have questioned this philosophy and bench models have demonstrated several shortcomings of KBD. Instead, the optimal strategy may centre on performing POT, followed by side branch dilation, and completed with a final (re)-POT. The following review article describes how to perform POT and presents the evidence to support its’ routine use. The coronary tree is comprised of arteries which divide into ever smaller branches to supply the myocardium. This means that the diameter of the vessel proximal to a bifurcation is always larger than the diameter of the main vessel distal to the bifurcation. The proximal optimisation technique (POT) was proposed by Dr Olivier Darremont as a technique to compensate for this difference in diameters when bifurcation lesions are stented. The technique is fully supported by the European Bifurcation Club and is a key part of the consensus statement produced by this group of experts.1 A short balloon is expanded in the proximal main vessel just up to the carina. This enables full expansion and complete apposition of the stent in the proximal main vessel. In addition, the POT also facilitates re-crossing into the side branch in order to optimise the final result if required. The following review article describes how to perform the technique and presents the evidence to support its routine use. The coronary tree is composed of vessels which branch into vessels of decreasing diameters. This follows Murray’s Law which states that the radii of daughter branches are related to the radius of the parent branch. Therefore, at each branch point within the coronary tree, the diameter of the vessels can be predicted. 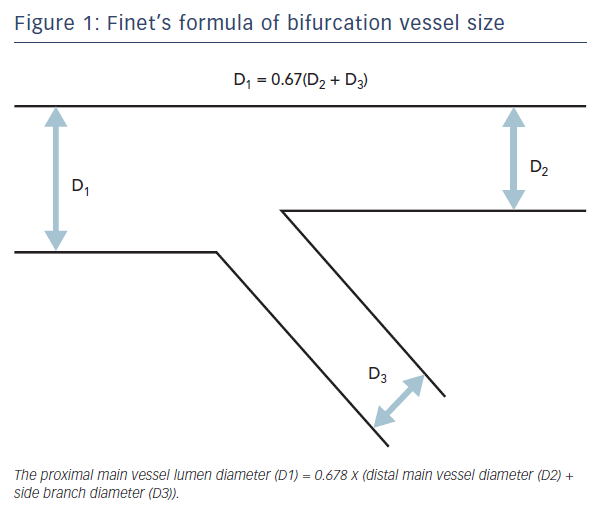 Professor Gérard Finet simplified Murray’s Law and showed that the proximal main vessel diameter closely approximates to the sum of the daughter vessel diameters (distal main plus side) multiplied by 0.67 (Figure 1). Therefore, for all bifurcations, the diameter of the distal main vessel will be consistently smaller than the diameter of the proximal main vessel. The greater the diameter of the side branch, the greater is the disparity between the diameter of the proximal main vessel and the vessel distal to the bifurcation. This difference in diameters is important when selecting a stent of appropriate diameter. If a stent is chosen based on the diameter of the proximal main vessel, this will be ‘over-sized’ for the distal main vessel. This may be associated with compromise of flow into the side branch as it can lead to shifting of the carina (Figure 2A). However, if the stent is chosen based on the diameter of the distal main vessel, the proximal part of the stent will be small relative to the vessel size (Figure 2B). This mal-apposition has implications particularly if a new guidewire is advanced through the stent as it may inadvertently pass behind the stent struts. Any further balloon dilatation will then crush the stent potentially leading to major complications including stent thrombosis.2 Importantly, this may not necessarily be evident to the operator on angiography or by ‘tactile feedback’ of the smoothness of wire passage. The aim of the POT is to fully appose the stent proximal to the bifurcation; in addition, POT expands the stent cells overlying the side branch ostium. A short balloon is taken and must be accurately positioned with the distal marker of the balloon placed at the carina, level with the side branch ostium (Figure 2C). This is best done by confirming a good position on orthogonal views. If positioned too distal, this could cause carinal shift, if too proximal then this will not appropriately expand the stent overlying the side branch ostium. If required, an additional balloon inflation is made more proximally to ensure that the inflow of the stent is fully apposed. To help accurately position the balloon, it is useful to use radiographic optimisation with techniques such as stent boost imaging. It is important to choose a correctly-sized balloon (non-compliant or semi-compliant) that will adequately expand the proximal part of the stent. Bench models have been key to developing the concept of the POT and demonstrate the associated excellent anatomical / scaffolding result.3–6 In 2011, Foin et al.3 evaluated the concept in a bench model of commercially available stents. They demonstrated that a final POT was able to significantly improve the anatomical result following single stent implantation for a bifurcation, confirming the reduction in mal-apposition of the stent in the proximal main vessel. Furthermore, they also showed the potential downside of final kissing balloon dilation (KBD) which has traditionally been recommended in clinical practice. KBD caused asymmetrical stent (over)expansion in the region where both balloons were expanded together, as well as development of mal-apposition of the proximal part of the main vessel stent (Figure 3). Foin and colleagues went on to carry out a further bench study and proposed a step-wise post-dilation strategy in preference to KBD.4 In this second study, following stent implantation, they performed POT followed by side branch balloon-inflation. The final step was either KBD or a final POT. As before, KBD was shown to have unfavourable features causing elliptical over-expansion of the stent proximal to the carina, as well as distortion of the proximal part of the main vessel stent with development of mal-apposition (even though POT had been done prior to the KBD). However, the step-wise approach (POT, side branch dilation, then re-POT) led to a more favourable result with significantly less strut mal-apposition at the proximal edge of the stent. In addition, POT expanded the stent cell overlying the side branch ostium. This is advantageous as it has the potential to make it easier to re-cross a guidewire into the side branch and may also facilitate ‘optimal re-cross’. When a provisional strategy is used, re-cross should ideally be performed through a distal stent cell.12 This ensures that balloon inflation will produce better clearance of struts from the side branch ostium. The studies by Foin have been subsequently supported by a further bench model study6 that evaluated six strategies: (i) KBD alone, (ii) POT then KBD, (iii) POT then asymmetrical KBD with the main vessel balloon inflated and maintained at 12 atm and the side branch balloon inflation reduced from 12 atm to 4 atm, (iv) POT then asymmetrical KBD with side branch balloon inflated and maintained at 12 atm and the main vessel balloon inflation reduced from 12 atm to 4 atm, (v) POT then side branch inflation (SBI), (vi) POT then SBI at 12 atm then re-POT.6 Each strategy was evaluated in two different stent designs. The results demonstrated that the best geometric result was obtained from POT – SBI –re-POT. Compared to techniques utilising KBD, the POT – SBI – re-POT strategy reduced the proximal area overstretch and restored circularity, reduced the side branch ostium stent-strut obstruction, and significantly reduced global strut mal-apposition (from 40 ± 6.2 % to 2.6 ± 1.4 %). Recently, Murasato et al.5 used a bench model to suggest that a compliant balloon may be preferable to the use of a non-compliant balloon to optimise strut apposition during POT. High pressure is not a pre-requisite as the balloon merely needs to dilate the unopposed stent; however, an adequately large balloon diameter is obligatory. For some larger vessels, the expansion range of non-compliant balloons will limit their ability to fully appose the struts whereas the greater expansion range of a semi-compliant balloon could be advantageous. For example, if a vessel is 4.9 mm diameter, a 4.5 mm non-compliant balloon may only reach a maximal diameter of 4.8 mm whereas a semi-compliant balloon will easily expand to 5.0 mm. All of these bench studies provide evidence to support the potential benefits of POT (Table 1) and emphasise the importance of always completing the procedure with a final POT. This can correct both the mal-apposition as well as improve the elliptical shape back to a circular lumen which will favourably influence the flow dynamics. This information forms the basis by which experts including the European Bifurcation Club have adopted and strongly support the routine use of POT. It is important to appreciate that the clinical trials evaluating various bifurcation strategies (e.g. one stent versus two-stent strategies) were performed prior to the widespread adoption of POT. However, there seems no reason why the important information obtained from bench model studies should not be incorporated into clinical practice. Randomised controlled studies have demonstrated that, for the majority of bifurcations, a single stent strategy is preferred over a twostent strategy; with recent data suggesting improved 5-year survival for the simpler technique.17 The recommendation from the EBC is that both vessels are wired, with pre-dilation of the main vessel if required.1 Pre-dilatation of the side branch is to be avoided if possible as, if this causes dissection, the side branch will be more difficult to re-wire once the main vessel has been stented. The main vessel is stented using a stent diameter based on the reference diameter of the main vessel distal to the bifurcation (Figure 4). The stent must be long enough to cover sufficient length of the proximal main vessel to allow POT to be performed, bearing in mind that the shortest available balloon may be 6 mm or 8 mm in length. After stenting, POT is performed to optimise stent expansion. In addition, this balloon dilatation will also open the stent cells overlying the side branch ostium and may partially scaffold the side branch ostium. In the majority of situations, the procedure can be terminated at this point. However, if there is concern regarding flow into the side branch, POT facilitates successful re-wiring of the side branch to enable further balloon dilatation +/- stent implantation. Based on information from the bench models, the procedure should always end with a final POT. The efficacy of KBD from registry data is contradictory. The first COBIS registry21 evaluated 1,065 patients of which 736 (69 %) were treated with KBD. At 22 months’ follow-up, there was a significantly higher rate of MACE in those treated with KBD (10.0 % versus 4.9 %, p<0.05), driven by a higher rate of TLR in the KBD group (9.1 % versus 3.4 %, p<0.05). The subsequent COBIS II registry demonstrated quite the opposite and suggested that KBD might in fact be favourable.22 This study evaluated 1,901 patients with a bifurcation lesion treated by single drug-eluting stent implantation. KBD was performed at the discretion of the operator in 620 patients (32.6 %), notably a lower proportion than that seen in the first COBIS registry. At a median follow-up of 36 months, those treated with KBD had a significantly lower rate of MACE (adjusted hazard ratio [HR]: 0.68, 95 % CI: 0.46 to 0.99; p=0.048). This benefit remained apparent after propensity score matching (545 pairs, adjusted HR: 0.50, 95 % CI: 0.30 to 0.85; p=0.01); with a significantly lower rate of TLR in the KBD group. Ongoing in vivo work is being undertaken to evaluate POT in clinical practice and will potentially provide clinical evidence to back-up the evidence from bench studies. Studies have been designed that incorporate OCT imaging as a tool to identify stent strut malapposition, which is proposed as a surrogate marker for a higher risk of adverse clinical events. The importance of POT to facilitate optimal guidewire re-crossing during two-stent bifurcation procedures is illustrated by a case report published by Wurtz and colleagues.2 They reported a patient who presented with stent thrombosis six years after undergoing Culotte bifurcation stenting. They showed, by OCT, that there had been inadvertent abluminal wiring during the original procedure. Instead of seeing a circular double layer of stent struts in the proximal main vessel, there was evidence that the side branch stent had been completely crushed in the proximal main vessel. This was not evident on angiography at the time of the index procedure. Importantly, this could have been avoidable if POT had been performed prior to re-wiring; however, this technique was not part of clinical practice at the time the original procedure was undertaken. The proximal optimisation technique is a key part of treating large bifurcation lesions and will optimise results of both single and twostent strategies. Technique is important – an appropriately sized balloon should be positioned and inflated just up to the carina. When performed well, the enhanced lesion scaffolding, reduced strut malapposition and improved flow dynamics are likely to translate into improved clinical results. Lassen JF, Holm NR, Banning A, et al. 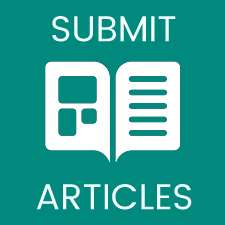 Percutaneous coronary intervention for coronary bifurcation disease: 11th consensus document from the European Bifurcation Club. EuroIntervention 2016;12:38–46. Wurtz M, Christiansen EH, Kristensen SD, Holm NR. Accidentally crushed stent during complex bifurcation treatment. A potential cause of very late stent thrombosis. Int J Cardiol 2015;197:113–5. Foin N, Secco GG, Ghilencea L, et al. Final proximal postdilatation is necessary after kissing balloon in bifurcation stenting. EuroIntervention 2011;7:597–604. Foin N, Torii R, Mortier P, et al. 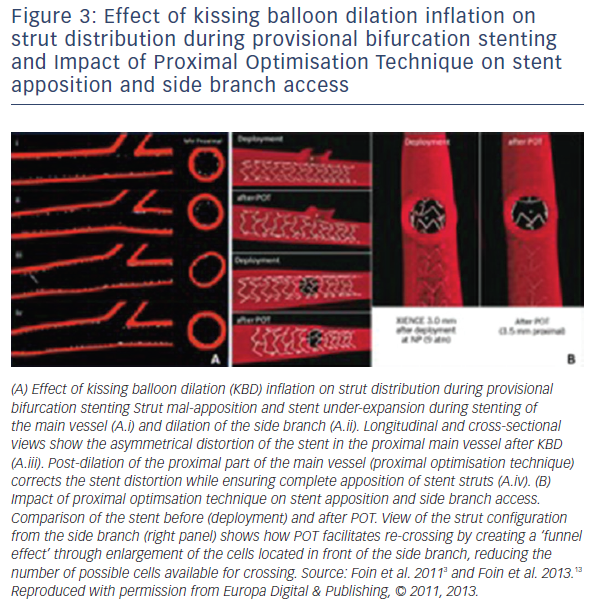 Kissing balloon or sequential dilation of the side branch and main vessel for provisional stenting of bifurcations: lessons from micro-computed tomography and computational simulations. JACC Cardiovasc Interv 2012;5:47–56. Murasato Y, Finet G, Foin N. Final kissing balloon inflation: the whole story. EuroIntervention 2015;11 Suppl V:V81–5. Finet G, Derimay F, Motreff P, et al. Comparative Analysis of Sequential Proximal Optimizing Technique Versus Kissing Balloon Inflation Technique in Provisional Bifurcation Stenting: Fractal Coronary Bifurcation Bench Test. JACC Cardiovasc Interv 2015;8:1308–17. Guerin P, Pilet P, Finet G, et al. 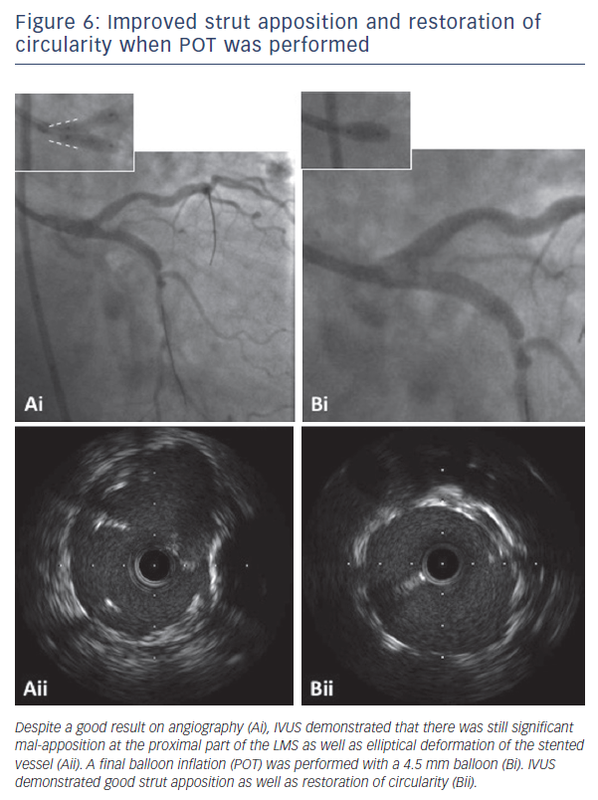 Drug-eluting stents in bifurcations: bench study of strut deformation and coating lesions. Circ Cardiovasc Interv 2010;3:120–6. Basalus MW, Tandjung K, AA van Apeldoorn, et al. Effect of oversized partial postdilatation on coatings of contemporary durable polymer-based drug-eluting stents: a scanning electron microscopy study. J Interv Cardiol 2011;24:149–61. Basalus MW, van Houwelingen KG, Ankone MJ, et al. Microcomputed tomographic assessment following extremely oversized partial postdilatation of drug-eluting stents. EuroIntervention 2010;6:141–8. Gastaldi D, Morlacchi S, Nichetti R, et al. Modelling of the provisional side-branch stenting approach for the treatment of atherosclerotic coronary bifurcations: effects of stent positioning. Biomech Model Mechanobiol 2010;9:551–61. Otake H, Shite J, Ako J, et al. Local determinants of thrombus formation following sirolimus-eluting stent implantation assessed by optical coherence tomography. JACC Cardiovasc Interv 2009;2:459–66. Ormiston J, Darremont O, Iwasaki K, et al. Lessons from the real bench: non-BRS. EuroIntervention 2015;11 Suppl V:V27–30. Foin N, Mattesini A, Ghione M, et al. Tools & techniques clinical: optimising stenting strategy in bifurcation lesions with insights from in vitro bifurcation models. EuroIntervention 2013;9:885-7. Foin N, Gutierrez-Chico JL, Nakatani S, et al. Incomplete stent apposition causes high shear flow disturbances and delay in neointimal coverage as a function of strut to wall detachment distance: implications for the management of incomplete stent apposition. Circ Cardiovasc Interv 2014;7:180–9. Lee R, Foin N, Ng J, et al. Early coverage of drug-eluting stents analysed by optical coherence tomography: evidence of the impact of stent apposition and strut characteristics on the neointimal healing process. EuroIntervention 2016;12:e605–14. Giannoglou GD, Antoniadis AP, Koskinas KC, Chatzizisis YS. Flow and atherosclerosis in coronary bifurcations. EuroIntervention 2010;6 Suppl J:J16–23. Behan MW, Holm NR, de Belder AJ, et al. Coronary bifurcation lesions treated with simple or complex stenting: 5-year survival from patient-level pooled analysis of the Nordic Bifurcation Study and the British Bifurcation Coronary Study. Eur Heart J 2016;37:1923–8. Korn HV, Yu J, Ohlow MA, et al. Interventional therapy of bifurcation lesions: a TIMI flow-guided concept to treat side branches in bifurcation lesions--a prospective randomized clinical study (Thueringer bifurcation study, THUEBIS study as pilot trial). Circ Cardiovasc Interv 2009;2:535–42. Niemela M, Kervinen K, Erglis A, et al. Randomized comparison of final kissing balloon dilatation versus no final kissing balloon dilatation in patients with coronary bifurcation lesions treated with main vessel stenting: the Nordic-Baltic Bifurcation Study III. Circulation 2011;123:79–86. Niemela MJ, Holms NR, Kervinen K, et al. Randomized Comparison of Final Kissing Balloon Dilatation Versus No Final Kissing Balloon Dilatation in Patients With Coronary Bifurcation Lesions Treated With Main Vessel Stenting. Five Year Clinical Outcome in The Nordic-Baltic Bifurcation Study III. J Am Coll Cardiol 2015;66(15, suppl):B11. Gwon HC, Hahn JY, Koo BK, et al. Final kissing ballooning and long-term clinical outcomes in coronary bifurcation lesions treated with 1-stent technique: results from the COBIS registry. Heart 2012;98:225–31. Yu CW, Yang JH, Song YB et al. 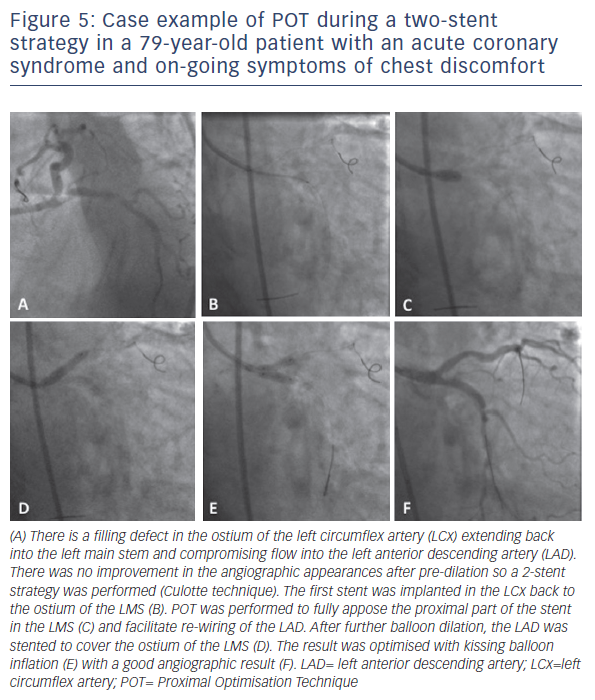 Long-Term Clinical Outcomes of Final Kissing Ballooning in Coronary Bifurcation Lesions Treated With the 1-Stent Technique: Results From the COBIS II Registry (Korean Coronary Bifurcation Stenting Registry). JACC Cardiovasc Interv 2015;8:1297–307. Hoye A, Iakovou I, Ge L, et al. 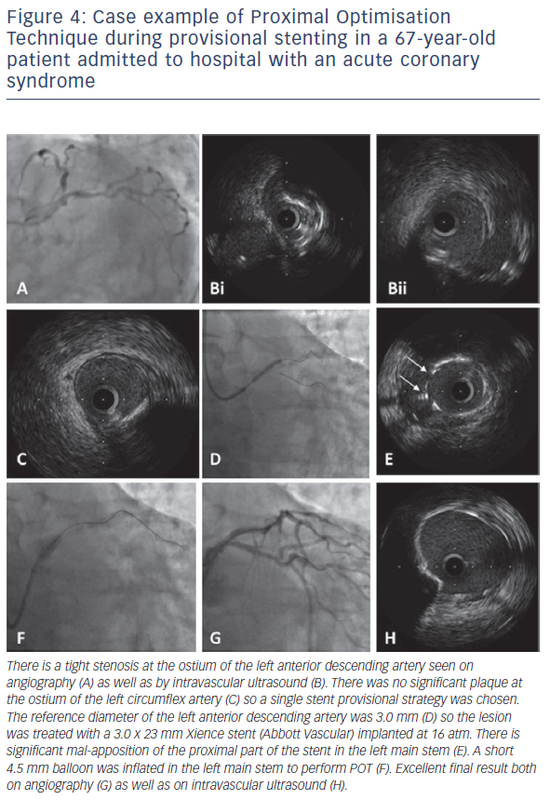 Long-term outcomes after stenting of bifurcation lesions with the “crush” technique: predictors of an adverse outcome. J Am Coll Cardiol 2006;47:1949–58. Sgueglia GA, Chevalier B. Kissing balloon inflation in percutaneous coronary interventions. JACC Cardiovasc Interv 2012;5:803–11. Chen SL, Zhang JJ, Ye F, et al. Study comparing the double kissing (DK) crush with classical crush for the treatment of coronary bifurcation lesions: the DKCRUSH-1 Bifurcation Study with drug-eluting stents. Eur J Clin Invest 2008;38:361–71. Chen SL, Xu B, Han YL, et al. Clinical Outcome After DK Crush Versus Culotte Stenting of Distal Left Main Bifurcation Lesions: The 3-Year Follow-Up Results of the DKCRUSH-III Study. JACC Cardiovasc Interv 2015;8:1335–42. Chen SL, Santoso T, Zhang JJ, et al. Clinical Outcome of Double Kissing Crush Versus Provisional Stenting of Coronary Artery Bifurcation Lesions: The 5-Year Follow-Up Results From a Randomized and Multicenter DKCRUSH-II Study (Randomized Study on Double Kissing Crush Technique Versus Provisional Stenting Technique for Coronary Artery Bifurcation Lesions). Circ Cardiovasc Interv 2017;10(2): pii. Rigatelli G, Dell’Avvocata F, Zuin M, et al. Complex coronary bifurcation revascularization by means of very minimal crushing and ultrathin biodegradable polymer DES: Feasibility and 1-year outcomes of the “Nano-crush” technique. Cardiovasc Revasc Med 2017;18:22–7. Ormiston JA, Webber B, Ubod B, et al. An independent bench comparison of two bioresorbable drug-eluting coronary scaffolds (Absorb and DESolve) with a durable metallic drug-eluting stent (ML8/Xpedition). EuroIntervention 2015;11:60–7. Derimay F, Souteyrand G, Motreff P, et al. Sequential Proximal Optimizing Technique in Provisional Bifurcation Stenting With Everolimus-Eluting Bioresorbable Vascular Scaffold: Fractal Coronary Bifurcation Bench for Comparative Test Between Absorb and XIENCE Xpedition. JACC Cardiovasc Interv 2016;9:1397–406. Ormiston JA, Webber B, Ubod B, et al. Absorb everolimuseluting bioresorbable scaffolds in coronary bifurcations: a bench study of deployment, side branch dilatation and postdilatation strategies. EuroIntervention 2015;10:1169–77.